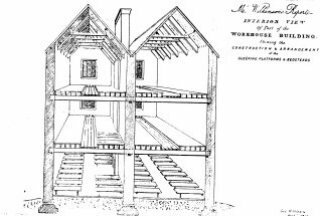 In January 1847 there were 111,000 people in Irish workhouses built to accommodate 100,000. By 1851, a full five years after the Government had declared the Famine over and knighted Trevelyan for his efforts, there were 918 inmates in Newry Workhouse. Distress in the West was worse. Due largely to overcrowding, the maintenance of discipline at Newry Workhouse was notoriously difficult. In most Ulster Unions discipline rarely featured at Board meetings, yet once the master and matron both claimed at a Board meeting that they had been assaulted. There was disharmony between the Board and staff. At Newry it was rare, if ever, that inmates were allowed to put their case. This was despite the fact that at an inquiry into indiscipline on 6 April 1850, the master produced a ‘leathern taws’ which he used for punishment. He claimed that he considered its use less severe than that of a ‘ratan or rod’. Thomas McCartney was whipped on 25 September 1847 for picking putty from recently replaced windows. With this weapon Owen Trainor was flogged on 1 September 1851 for ‘stealing onions’. On 1 December of the same year Francis Campbell and John Burns were flogged for ‘absconding with Union clothes’. Andrew Elliot too was flogged for this offence. It is unlikely they had other clothes, which would surely have been preferable to the easily identified ‘uniform’. One inmate was transported for seven years for ‘stealing a number of books and other articles from this establishment’. It was formally recorded that the Board approved of these punishments. It took the passing of the Children’s Performance Act 1887 and Children’s Charter Act of 1908 to offer some relief. Solitary confinement for periods of six to nine hours was a common punishment for ‘refractory behaviour’. Loss of meals was the most common punishment. Twenty nine women at the mill – where they ground the rock-hard Indian meal for use in the Workhouse stirabout from 7.30 am to 8.00 pm – had their dinner and supper milk stopped on 24 July 1851 for ‘neglecting and refusing to work’. It seems unlikely that such large-scale rebellion was without some underlying cause. Boards of Guardians minutes reveal how these women were worked till they fainted. The Guardians accepted the Master’s version without reprimanding him. The Seventh Annual Report of the Poor Law Commission 1841 had distinguished between disorderly and refractory behaviour, the latter being repeated examples of the former, or of offences of a more serious nature. We quote below of examples of less stringent discipline in Bradford Workhouse 1896 and 1900, compared with Ireland. The Commission prescribed for disorderly conduct that a pauper might, for no more than 48 hours, have all butter, cheese, tea, sugar or broth withheld: and instead of his usual meal, one consisting of eight ounces of bread, or one pound of cooked potatoes. For refractory conduct, a pauper might be confined to a separate room for no longer than twenty four hours, with or without an alteration of diet. Newry paupers might dream longingly of such ‘punishments’! In 1849 in Newry, Dr Davis complained that, despite his continued representations, the ‘privy’ in the workhouse garden had not been erected. One can scarcely imagine how the paupers, and especially those sick with dysentery and other complaints that affected the bowels, coped under such circumstances. The Workhouse suffered from inadequate fresh water supplies and lack of a suitable sewage system. With overcrowding, problems with damp straw bedding made disease more likely and prevalent. Davis‘s intervention eventually secured an extension to the Fever Hospital. The total number of sick for 1860 was 446, of whom just 222 had their disease on admittance. Davis urged the Board not to over-crowd the Workhouse. Filling beyond the one thousand capacity obviously exacerbated all internal problems. The Poor Law Commissioners in Dublin occasionally intervened at local level where there appeared to be a disproportionate number of deaths per inmate. ‘a food scarcity consequent upon high prices… an antipathy among the poor of entering the Workhouse, the prevalence of disease, and the fact that the great majority of new admissions were at ‘the point of death’. Many were known to die on the road, some between bed and placement on carts for conveyance to the Workhouse and a number had died within twenty-four hours of admission. As a consequence of overcrowding there was damp bedding which increased fever and bowel complaints.’ He felt it necessary to add that… ‘it is well known that many dying persons are sent for admission merely that coffins may be obtained for them at Union expense’. The same Dr Bell had earlier been admonished for entering well children of fever patients with them to the fever wards, thus adding to the crisis! The Protestant chaplain on the other hand, blamed the ‘poor quality of the food’. The bread was ‘very dark-coloured, not sufficiently baked, probably that it might weigh heavier, and sour. The broth was made of unsound beef, which according to wardmaster Lutton ‘was so offensive that when cutting it up after being boiled, he could hardly stand over it’. The Rev Oulton himself observed that it was… ‘more like the flesh of an animal that died of disease than of one that had been killed for food.’ He noted that… ‘the broth was thin, bad and dirty looking. The well at the kitchen, he remarked, ought to be examined. It was once in a very bad state and may be so again.’ He added that… ‘prisoners are entitled to good and wholesome food and paupers had the right to the same’. No doubt there is truth in all of these comments.